Cost-effective and professional excavations are what you’ll find at Krueger Excavating, Inc. Knowledgeable technicians offer more than 15 years of experience in tackling jobs for residential, commercial, and municipal clients in Prior Lake, MN. Whether you’re breaking ground on a new home or you need sewer line repairs, the experts at this locally owned business will deliver quality craftsmanship and excellent customer support. Staying up to date with the latest technology and innovations in the field, this trusted excavating contractor provides reliable services. Their powerful earth movers prepare sites for buildings, landscaping, and utilities. Crews will work to ensure your sewer and water lines are properly installed. You can count on them to coordinate with subcontractors to meet deadlines and cut costs. 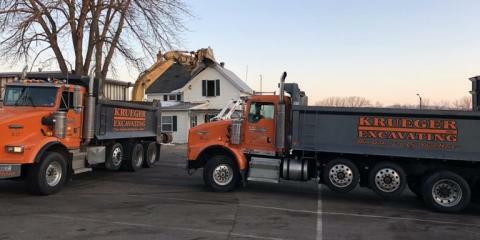 When searching for a reliable team to execute your excavations, turn to the experienced staff at Krueger Excavating. Call them today at (952) 447-8335 to request a quote or visit them online for more information.